Darjeeling: The Gorkha Janmukti Morcha's trade union has decided to accept an interim hike of Rs 17.50 in the worker's daily wage but a sour note has been stuck with the body stating that gardens would be allowed to dispatch their first flush as and when they clear the bonus dues. 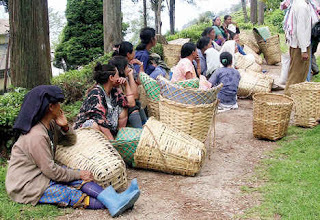 Bharat Thakuri, the general secretary of the Darjeeling Terai Dooars Plantation Labour Union, said: "Since this is an interim hike, we will accept this it. However, negotiations for minimum wages will continue." The state government has fixed a meeting in Calcutta on March 12 to discuss the minimum wage for tea garden workers. During a meeting in Siliguri on Thursday, the state government has directed the hill tea garden management to provide an interim hike of Rs 17.50 from 1 April 2018 onwards and clear the bonus dues by March 10. The hill gardens had agreed to pay bonus at the rate of 19.75 per cent of a worker's annual earning but most gardens have cleared only 50 per cent of the bonus citing the three-month strife in the hills. The Morcha and the GNLF had earlier threatened to stop the dispatch of first flush tea from March 1 if the bonus was not cleared. Balaram Tamang, the general secretary of the Darjeeling subdivision committee of the Morcha's trade union, said: "As far as dispatch is concerned, we will allow the gardens to send their consignment as and when the respective gardens clear their bonus." Sandeep Mukherjee, the principal advisor to the Darjeeling Tea Association (DTA), however, cried foul at the union's decision. "The state government has asked us to clear the bonus by March 10. This means we should be allowed to dispatch our products till March 10 so that we can generate funds that will help us clear the bonus," said Mukherjee. "Such a decision by the union goes again the spirit of the agreement and the direction of the state government and will also unnecessarily precipitate a situation in the gardens," said Mukherjee. Plucking of first flush leaves has only just started in the lower elevation gardens. Tamang, however, said: "The earlier the gardens start paying the better it will be good for all. This way, gardens that pay will not be burdened unnecessarily." Regarding the interim hike, Mukherjee said they will have to pay as it is a directive from the state government. The Gorkha Janmukti Morcha's trade union has decided to accept an interim hike of Rs 17.50 in the worker's daily wage but a sour note has been stuck with the body stating that gardens would be allowed to dispatch their first flush as and when they clear the bonus dues.